Oh Sunnydale, you don't know how much I've missed you. Sure, Buffy was only gone for one episode, but the longing was still there. Our favorite slayer returned to town on Buffy the Vampire Slayer Season 3 Episode 2 after her adventure running away to Los Angeles. She eventually would have to return after the fallout of killing Angel and being kicked out by Joyce. "Dead Man's Party" was more teen drama than supernatural adventure. Do you agree? Let's find out by rewatching "Dead Man's Party." Buffy's return home to Sunnydale was so awkward. You could feel the uncomfortableness of everyone involved; it was the equivalent of seeing these characters walk on eggshells whenever they were around her. No one wanted to push Buffy. Joyce still felt guilty about the way she reacted to Buffy coming out as a slayer. Her attitude was overcompensating for the fact that she drove her daughter away. From an editing standpoint, the lack of music and background noise perfectly captured the tension between the pair. Even though Buffy returned home and Joyce was happy to be reunited with her, there was still an uncomfortable distance between them. Neither of them knew how to react to each other or approach their fractured mother/daughter relationship. 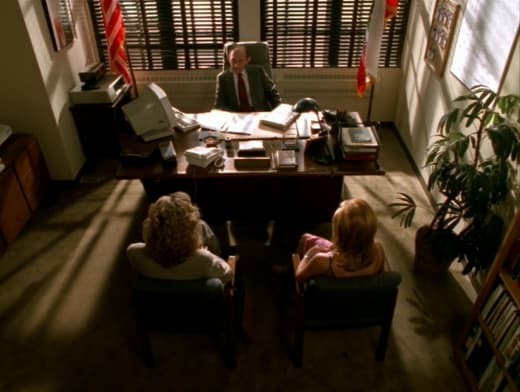 In hindsight, it's a shame that we didn't get to see the initial open conversation between Joyce and Buffy where they discussed their issues when Buffy returned home. Sure, we got their heated argument during the party, but that first catch-up when she came back would've given a full view to their situation. The awkwardness found its way to Buffy's reunion with her friends and Giles. My heart breaks for Giles whenever I rewatch the scene of him breaking down in the kitchen. The moment of Buffy's return was the culmination of his continuous search for her to no avail. He finally had her back, but he was in too much pain when he realized she was actually back in his life. From the reactions of the Scoobies, only Cordelia and Oz were their true selves around Buffy. Oz is apathetic at best and Cordelia mostly cares about herself regardless. They're the second generation friends in the group while Willow and Xander should've had all the reaction. Xander brushed it off with sarcasm, but he didn't feel the urge to chat with Buffy. Willow, on the other hand, was the most surprising. She not only was silent around her, but she fully bailed on her at the coffee date. That was so petty of her! Regardless of Willow being hurt by Buffy abandoning her, Willow would never have simply ignored her friend. Her missing the hangout was completely out of character. Buffy: I'd like to find Willow and Xander. Permalink: Only if they give me lip. Principal Snyder wouldn't have been able to keep Buffy out of school permanently. Since she was cleared of all her charges in Kendra's murder, his expulsion had no basis to stick. He was being petty and made it a personal thing. Eventually we saw Giles threaten Snyder and the school board stepping in to overrule the decision, but we did miss out on the potential "Joyce letting out her complete fury" scene. Just imagine Joyce starting a war against Principal Snyder over this entire debacle. The campaigning fight would've been epic to watch as she slowly destroyed that man. Pat: Obvious fodder or missed potential? 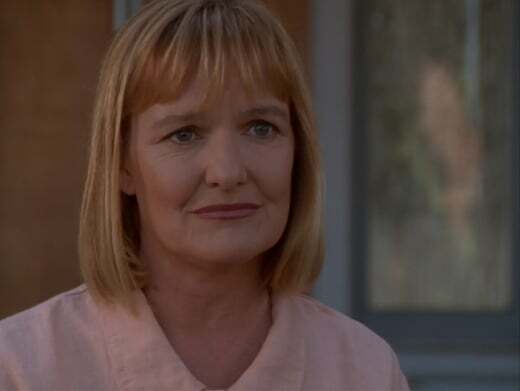 Regardless of watching Buffy the Vampire Slayer Season 3 Episode 2 in 1998 or rewatching it now, Pat seemed like a character who was cut too soon. There could've been so much use for a role that served as Joyce's confidant and friend. She got Joyce to be truthful and honest about her inner concerns in passing conversation. On the other hand, she did seem like the type of character who would get picked off easily in Buffy's world. She was too sweet and kind to fight against any of the demons, as compared to Joyce who went right into fighting zombies. Her importance could go either way. She was a nice character but not a necessary one in the grand scheme. Back in 1998 (before learning about the ways of TV casting), I had thought that Angel returning in the dream sequence was going to be his role. His character was dead and he'd be a figment in her imagination. People weren't ready to say goodbye, so the show found a way to bring him back. Looking back at it now, his appearance in her dream felt closely tied to Buffy's slayer premonitions. Her powers were warning her about Angel's eventual return. The dream was giving her the answers that she needed during her lowest moment while also foreshadowing his eventual return. This may be a stretch; however, you can't ignore the vivid Buffy dreams. They happened for a reason and this was clearly a vivid one to notice. If you ever needed an example of how Buffy the Vampire Slayer was inspired by horror tropes, the events that led up to the house party were a good example. The planning, discussion and resurrection were straight out of what you'd expect in a teen horror movie. Come on, we had a glowing creepy mask that brought a cat back from the dead! And, what should've been a quaint group dinner became a house party full of drinking that turned into chaos. There was also an argument about Buffy's future and going to other schools. Teen horror was all over that progression. Speaking of the party, did her friends not realize she would be uncomfortable about the whole thing? Xander ignored Buffy to hangout with Cordelia and Willow fully bailed on their coffee afternoon. She just got back to town; the last thing she would want is to be at a house party with a bunch of people she didn't know. They could've just asked her what she wanted. Willow is one of my favorite characters; however, I find her incredibly frustrating during Buffy the Vampire Slayer Season 3 Episode 2. Even when Buffy (her best friend) asked her if something was wrong and wanted to have an honest chat with her, Willow lied and stayed quiet. Buffy wasn't stupid, she knew something was going on. This omission only continued the snowball effect which led to their blow-up later on during the party. "Dead Man's Party" was not Willow's finest hour. Even thought Buffy overheard Joyce's chat with Pat, it was the full scope of her return back (i.e. the party, Willow & Xander, school) that pushed her to want to run away again. Everything kept building and building until it was too much for her to handle. Her decision can't solely be blamed on Joyce or Willow. When Buffy started packing her bag, she was being a tad dramatic about the whole situation. Don't get me wrong, she was still heartbroken about killing Angel and she couldn't deal with the reality. However, she could've talked it out with her mother or be candid with like Giles/the Scoobies. She was quick to runaway again. Having all of this drama erupt at the pasty was not the time or the place. On the other hand, the group was bottling it up too much; their real feelings and intentions couldn't be hidden anymore. Willow: You're leaving again? What, you just stopped by for your lint brush and you're ready to go? Buffy: It's not like anyone will mind. Willow: Oh, no...have a great time and don't forget not to write! Buffy: Why are you attacking me? I'm trying. Willow: Wow, and it looks so much giving up. Buffy: I'm just trying to make things easier. Buffy: You guys were doing just fine without me. Willow: We were doing the best we could. It's not like we had a lot of choice in the matter! Buffy: I'm sorry that I had to leave, but you don't know what I was going through. Willow: Well, I'd like to. Willow: Well...maybe I don't need to understand. Maybe, I just need you to talk to me. Buffy: How can I talk to you when you were avoiding me? Permalink: Why are you attacking me? I'm trying. We have to give some credit to Cordelia. In her own Cordelia-esque way, she was trying to relate to Buffy and be sympathetic to her feelings. Unfortunately, it blew up in her face, but at least she tried. Nothing was going to stop the train once it was off the tracks. Buffy, Willow, Xander and Joyce were in full on argument mode. And we can't fault any of the stuff they said,; they were all right in their comments, especially since it was their thoughts and feelings. If the zombies hadn't have broken in, would Buffy have taken off? She was ready to go; however, I would guess that she would've stuck around and the group would chat about it further. She came back all this way. Buffy, and all of the Scoobies/Joyce, were just in the heat of the moment. Buffy: Cordy! Get outta my shoes! Cordelia: I’m just trying to help, Buffy. Permalink: Cordy! Get outta my shoes! The obvious comparison for "Dead Man's Party" is that it's inspired by Night of the Living Dead. Nothing was going to stop the zombies from getting into the house. We knew better that the stakes weren't going to work against the undead; the Scoobies would need stronger firepower, which they didn't have. The group was smart to give up barricading the place and run for cover. The undead would've pushed their way inside to get the mask. Once Pat had been grabbed by the zombie and no one saved her, it was obvious that she had been killed. The undead made the point of killing people; she wasn't going to be the exception. From a continuity standpoint, how did she end up from the main floor to the top? Did she run upstairs for cover and then got killed? It didn't make a lot of sense where they found her body. After she placed on the mask, her demon persona seemed like a cross between The Mask and Pennywise the Clown. The mask merged to her face and she had the ability to stun people with light. Did anyone else notice that? She was an easy vanquish, especially when all Buffy had to do was stab the eyes. Oz didn't even need to give her the information and Buffy didn't need to push her out of the window. Overall, the zombie mask was more powerful in the buildup to the reveal than the actual monster itself. Though, in the aftermath of the undead rising, did no one question whatever happened to the dead bodies? All of the zombies disintegrated into light once Pat was defeated. There were plenty of zombies around Sunnydale who had been brought back to attack the Summers home. Somebody had to have worried about these missing bodies, especially the family members of the deceased. The missing bodies aren't a bit plot hole concern, but it's something to think about. Buffy: Fine. Okay. I'm the bad. I can take my lumps...for a while. Willow: Alright. I'll stop giving you a hard time...runaway. Permalink: I can take my lumps...for a while. As mentioned above, Willow and Buffy making peace should've happened a long time before. Their reconciliation as best friends didn't need a zombie Monster of the Week to make it happen. Regardless, seeing these two reunite made me smile. Buffy and Willow had a great friendship, and the way they teased each other showed that they loved being best friends. They naturally got back into their rhythm; all they needed was time. What did you think of "Dead Man's Party"? How many people do you think got killed at the party? 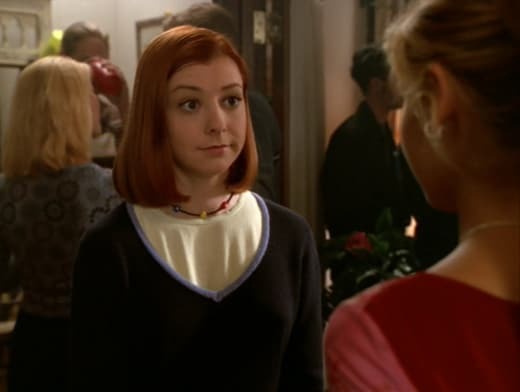 Should Willow have shared her concerns sooner with Buffy? Was Buffy wrong in expecting everything to go back to normal? Want to join us in rewatching Buffy the Vampire Slayer? We'll be posting new rewatch posts on Tuesdays and Thursdays. Come back here and let us know what you think of the episode.